Yesterday on FOX, Rudy Giuliani stated the standard GOP policy line that families, cities and states must balance their budgets and thus the Federal government must balance its budget too. That is a false analogy. Cities and states must balance their budgets by law, and they cannot issue their own currency. Sovereign nations outside the European Union can and do issue their own currencies and thus need not balance their budgets annually. Rudy was being deliberately obtuse or he is economically illiterate. Perhaps as a former mayor of New York City, he is not familiar with budgeting at the Federal level. It is true that families and the Federal government must balance their budgets or generate a surplus to pay down debt over the intermediate to long-term, but it is not true that both families and the Federal government must balance their budgets annually. Families and the Federal government can and should go into debt when circumstances so require. Families are prohibited from issuing their own currency (counterfeiting), but the Federal government can and should act to counter recessions by stimulating the economy. In the past, the Federal government has helped cities and states maintain employment during recessions. In the current Great Recession, the GOP in Congress have opposed stimulating the economy sufficiently and they have opposed helping cities and states to maintain local employment. In my opinion, the GOP wants a sluggish economy for political reasons. 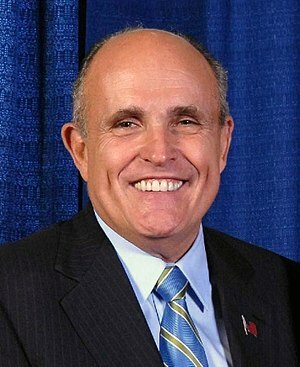 Rudy says, Rudy don’t think! Rudy perrot talk! My pleasure! It hard not to comment to such egregious behavior, show of power unlimited! Good point! Forget families. A better financial analogy to the federal government is an entity like a coporation with an open-ended earning life. So long as it’s an on-going business, what matters is the ratio of debt to other metrics, like income.